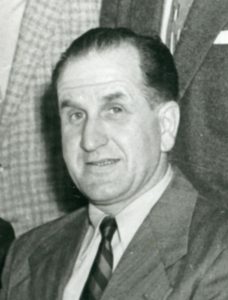 The late Gerry Karges was one of the four founders and one of the coaches of the four local teams when minor hockey originated in Port Dover on November 8, 1942. Thus began an illustrious career for Gerry Karges that spanned decades and included a historic meeting with his counterparts in Brantford that led to the eventual formation of the Ontario Minor Hockey Association. Gerry served as President of Port Dover Minor Hockey for its first seven years and later held other executive positions. In addition, for many years he successfully coached or managed all categories of minor hockey rep teams, then called all-star teams. Gerry coached the Port Dover Midgets to a Southern Ontario Minor Hockey Association championship and took the same team to the OMHA quarter-finals in 1957-58. He coached and/or managed many teams from minor hockey to senior hockey. He started two girls’ hockey teams for Port Dover Composite School and coached one of them. Gerry started a team that was the only rep hockey team below Pee Wee that played exhibition games with other towns. This was before the Ontario Minor Hockey Association recognized this category, at first calling it Novice. Gerry managed the 1967-68 Port Dover Novice Rep team when the goalie was Rick Wamsley, who later became an NHL goalie and a Sports Hall inductee. Gerry Karges influenced the careers of other well-known players from Port Dover. From 1945-47 Gerry managed the Port Dover Juvenile rep team to the OMHA semi-finals. This team included George Burcham who went on to play semi-pro; Sonny Lowe, a long-time local star; and Chucky Lloyd, who later played Junior “A” for the Barrie Flyers. Gerry is credited with starting Leonard “Red” Kelly on his way to an outstanding career in the NHL. Gerry coached the Port Dover Thunderbirds, who won the Ontario Rural Hockey Association senior championship in 1961-62. This was the first men’s provincial championship for Port Dover. Karges could be called a “true rink rat”. He would open the arena after his workday was over and managed it for several years without compensation. He was instrumental in leading numerous fundraising campaigns to support minor hockey and arena renovations. It was common for Gerry to dress in costume during Port Dover’s July 1 parade to raise money for minor hockey. In 1969 he walked 24 miles for a new arena floor. In 1963 Gerry was made a life member of the Port Dover Minor Hockey Association and in 1972 he received the OMHA Honour Award. Gerry Karges was a driving force and major influence in Port Dover hockey until his death in 1985.